The roof project at Forto’s Fort is a huge project. We have been working on it for three days and as we go along we are finding more and more “hidden gems” along the way. This is where we found the bat’s nest as well as the section of the roof that was seamed together with 10 inch 2×4’s we seemed them together with 4 foot 2×6’s. Because the people installed the roof and tried to cut corners (by seaming it together with 2×4’s), the roof had a noticeable sag of almost 4 inches or more. 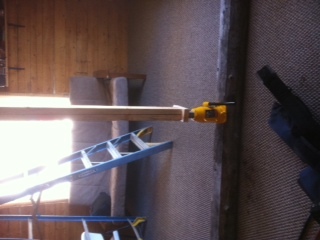 We had to use jacks to make it level. 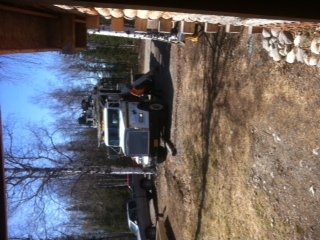 We are to maneuver around the ceiling fan to position the jacks. 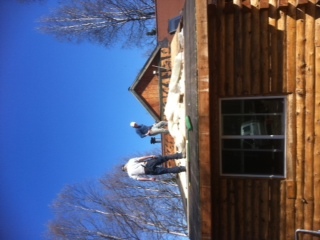 Here is the roof at the end of Day 1. 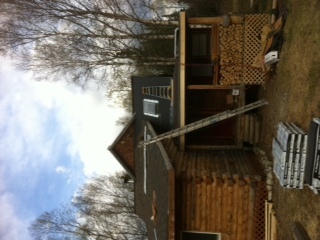 The sagging repair is completed and this section is ready for shingles! Our materials are here from Spendard Building Supplies in Wasilly! End of Day 3. We had to repair and replace a lot of old wood above the porch and remove a skylight that was above the porch too. 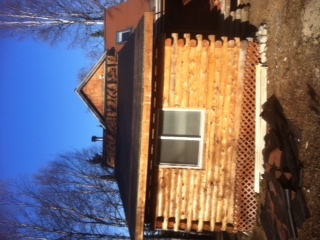 The front section has the shingles installed.